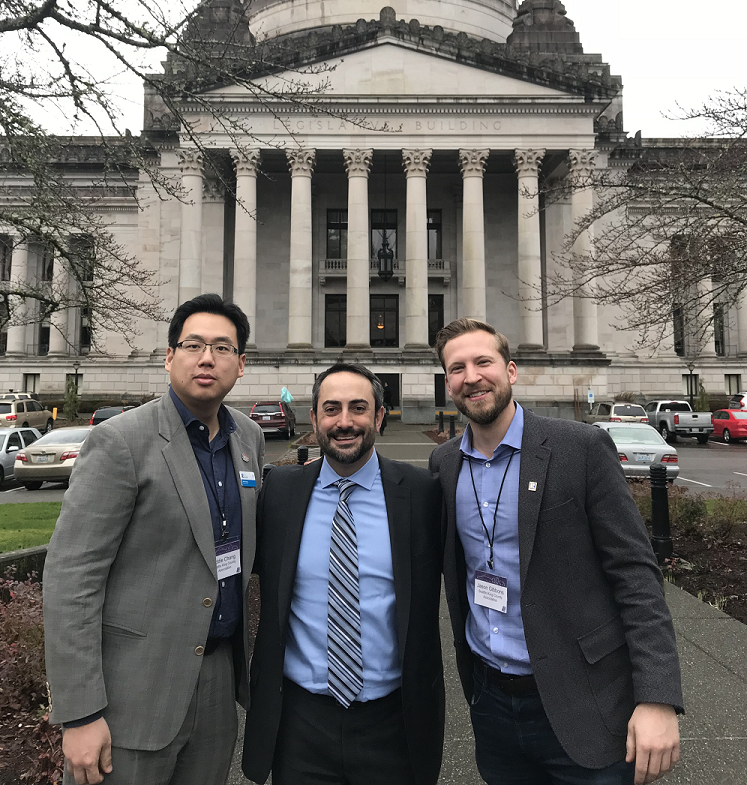 Pictured: Seattle King County REALTORS® Director Eddie Chang (left) and REALTOR® Jason Gibbons (right) outside the State Capitol with Senator Guy Palumbo. Telling stories of qualified buyers losing out on offer after offer, young buyers moving further and further away from job centers, and expressing the increasing frustrations of housing consumers, REALTORS® met with legislators to talk about housing supply and affordability. The problem, as you know by now, is housing inventory. There just aren’t enough places to live to go around, so housing costs keep going up. Last year was the fifth successive year that the housing supply in King County has averaged less than two months, and for 2017 that number was less than a month. At their Legislative Hill Day, REALTORS® from across Washington heard that shrinking inventory isn’t just a problem in King County, but that urban and suburban areas state-wide are plagued by housing shortages. Hardworking renters, homeowners, and home buyers continue to suffer rapidly increasing prices and a severe lack of options. Senator Guy Palumbo (D-Maltby) gave a keynote address pointing out that several changes to the Growth Management Act (GMA) could help produce more housing supply. Senator Palumbo, a former planning commissioner from Snohomish County and land use expert, said that after 25 years, the GMA needs to respond to marketplace realities. He also detailed the improvements that could be made in the North Creek area of his own district. Senator Palumbo recently introduced SB 6077, which ensures increased density for housing supply inside Urban Growth Areas, also known as UGAs. Washington REALTORS® supports this bill.